But what Jessie doesn’t realize is that Jimmy is the least of her problems.In Las Vegas she meets Russ, a mesmerizing stranger who shows her how to gamble, and who never seems to lose. Curious, Jessie wants to know his secret, and in response, alone in his hotel room, he teaches her a game that opens a door to another reality.To Witch World.Suddenly Jessie discovers that she’s stumbled into a world where some people can do the impossible, and others may not even be human. For a time she fears she’s lost her mind. Are there really witches? Is she one of them? Jessie and her senior class set off to their last high school adventure, traveling to Las Vegas together. She ends up in the car with her ex, Jimmy, the guy who broke her heart a few months back and is now trying to find his way back to her. In Las Vegas, Jessie meets Russ at a blackjack table, a stranger who has more secrets than she can imagine. He teaches her a game that changes all the rules Jessie has ever know and opens her eyes to the Witch World. That’s where the adventure begins. I have been a fan of Christopher Pike for years. His stories always fascinated me and his writing is excellent. 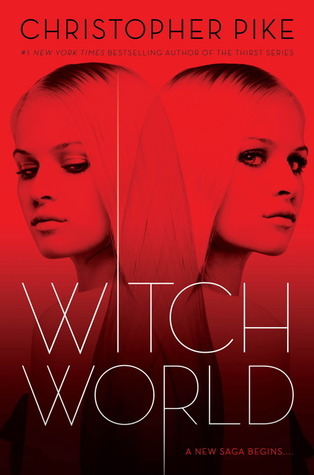 So when I got an opportunity to read Witch World, I jumped on it. Now, I don’t even know how to write this review without spoilers. The whole book was one giant surprise. Seriously, every page was like a new discovery. Once again, Christopher Pike created a story full of twists and turns and nail bitting suspense. Jessie was an interesting character. The contrast between her “real world self” and her “witch world self” were fascinating. The same goes for the rest of the characters. I liked how complex everything was, even when I was confused about what was going on. There is nothing simple about this book, and I think that’s partially why I liked it. It was definitely a lot more racy than I expected. People keep talking about that “new adult” genre or something and if I was to categorize Witch World, I’d probably use that as the category. Seriously, you need to read this book and tell me what you think. There is so much I wish I could say and I just can’t without giving something away. It was a long twisted read, but it was worth it. Any fan of Christopher Pike will enjoy this new installment in his writing. Witch World hits the shelves November 13th! Let me know what you think!